We love this light, tasty, and refreshing salad, and I always prepare it on weekends. If you are looking for new ways to incorporate spinach in your menu, this colorful salad will do the trick. If family or friends are coming over for lunch or dinner, they are sure to be requesting the recipe. It is a great alternative to traditional side dishes and combines delicious flavors. Vinegar and olive oil make for an easy and quick way to dress up vegetables, and feta is a great addition to this eye-catching salad. Rinse spinach and cherry tomatoes and dry and cut feta into cubes. 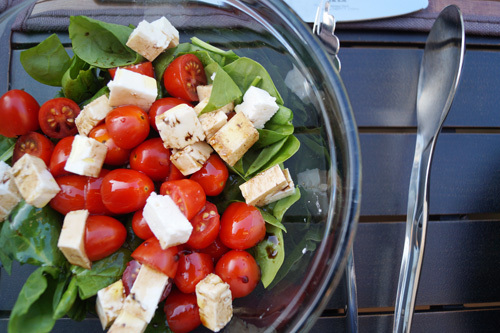 Use a serving bowl and add spinach leaves and cherry tomatoes and top with feta cheese. Toss gently. Combine balsamic vinegar and olive oil in a small bowl and mix well. Shake to blend. Pour the dressing on top and toss again to combine. Season salad with salt or crunchy salt if desired. Serve immediately or with the main course as a centerpiece. Arrange into 2 salad plates or dinner plates as a dish or side dish. Place in the fridge if preparing ahead of time. You can also add pine nuts, yellow egg tomatoes, vine tomatoes, cucumber, or other ingredients for a different version of this salad.